"Sampath Speaking" - the thoughts of an Insurer from Thiruvallikkeni: Amma drinking water project ~ 20 litres of potable water to poor ! Amma drinking water project ~ 20 litres of potable water to poor ! There are street pumps – and sometimes water flows on its own !! Which mineral water brand do you drink [ask in the style of Palmolive – which shaving cream do you use ?] 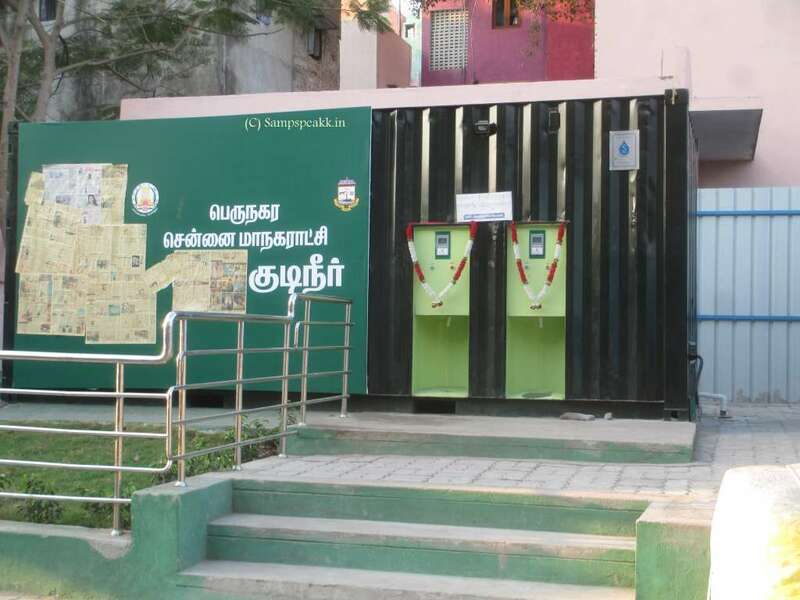 ~ and if you live in Triplicane, have you noticed this new structure in Pycrofts Road [Bharathi Salai] nearer T’cane Terminus. Chennai was marooned in Dec 2015 and that might affect the political fortunes of parties ! – water, has played a major role in electoral politics. About a century ago, things were different – subjects were initially dependent on shallow wells and later on Municipal water taps – people trying hard on hand-pumps was common at every house and at every streets. That water in the tap came from local pumping stations and primarily from the Kilpauk water works. Kilpauk Water Works holds several historical monuments and systems that were in use till about half decade ago. Inaugurated a century and a couple of years back, Kilpauk Water Works was the first treatment plant for the city with 80 million litres a day capacity then. It was increased to the existing 270 mld capacity in phases. The massive 60ft steel tank at the entrance was as old as the red-bricked buildings in the premises. A high-tension pump installed so many decades ago, ran tirelessly to distribute treated water to the residents. The bowl-like masonry structure, recently refurbished, is one of the first systems ever used to store water from the Red Hills reservoir and supply to the city as far back as in 1872. Once it was filled to the brim, water would branch off through vents on either side and then be transported to George Town and central Chennai through iron pipes. This scientifically-designed distribution system was launched by the then special engineer to the Corporation of Madras, J.W. Madeley. In Sept 2013, populist ‘amma water scheme’ was formally launched involving production and packaging of mineral water in 1-litre bottles, and selling them in long-distance running state-owned buses and in bus terminuses. The price was fixed at Rs. 10 per bottle. The project intended to make purified water available to people of all strata, at a reasonable cost - ‘amma water’ was straightaway hit ! Remember your school days…. [if you are 40+] ~ there used to be rusted iron pipes from the water tank……. Students would line before the water tank [very thought would make modern day youngsters and mothers scary] – there would be no tumblers or receptacles, one would open the tab / lift the nozzle, keep one’s hand in a manner that falling water would find its way to the mouth……none cared to check of its purity, taste, colour, odour and more…….. a few decades earlier, perhaps none would have imagined that water would be ‘crore industry – with multi-brands’ ruling the market…life has changed since !! Water today is a hot selling commodity – with Multinationals and big Corporates having their own brands and another chunk being garnered by local companies calling themselves ‘packaged water providers’. From potable water to mineral water, as it was sold in the beginning…… mineral water actually, is water from a mineral spring containing various minerals such as salts and sulphur compounds, much water has flowed….. Though the packaged water that you get in bottles / cans of various capacities…… may not even be chemically treated water containing any minerals ~ people are finicky, most cannot drink water in hotels, restaurants and public places but buy mineral water bottles – some cannot survive without specified brands. It is a Nation where in most States, people do not have access to quality potable water ~ but still vie to keep buying luxury mobile handsets at fancy prices….. every tab, every new phone sells thousands on the day of its launch….despite the fact that a high % of features are never used by the actual user. … with this background, that structure in Triplicane was attractive. 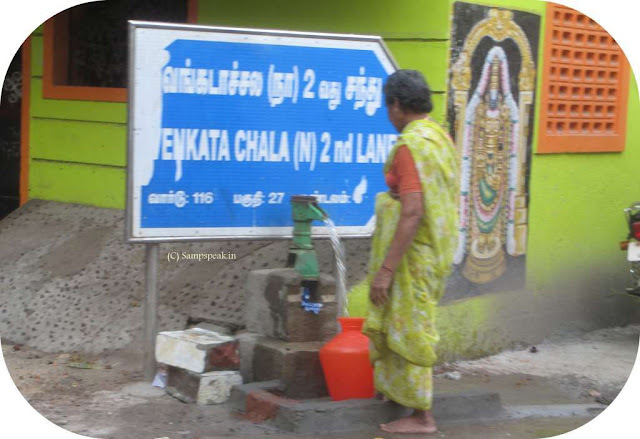 It is TN Govt’s initiative of providing quality drinking water to people free. Reports state that drinking water dispensing units based on reverse osmosis technology are being installed in 100 localities that has large number of poor and downtrodden. TN CM Ms J Jayalalithaa said that each family would receive 20 litre water freely per day through a smart card system under the scheme, she said. 'Amma Unavagams', 'Amma Salt', 'Amma Mineral Water' and 'Amma Magapperu Sanjeevi' … and now drinking water scheme. Each plant will have a capacity to purify 2,000 litres of water per hour; it would be enhanced depending on requirement, Jayalalithaa said in a statement. Each family would get 20 litres of purified water free every day, she said, adding that the quality of water would be tested in laboratories. The families are provided smart cards to collect water from Automatic Purified Water Dispensing Units. One may not support her political moves, nor like her political freebies ~ but this scheme like some others is quite attractive.